The Glasgow Centre for Contemporary Arts (CCA) is a platform for avant-garde contemporary visual art, film, music, performance, spoken word and other kinds of events. It is a hub of experimental creativity which aims to participate in community life in Glasgow and further afield. Six major exhibitions are held each year at the CCA, showcasing both Scottish and international art and it also houses the Intermedia Gallery which is dedicated to showing the works of emerging artists. There are regular screenings of independent local and international films and documentaries and performances of electronic, experimental and improvised music. Entry to many of the events and all of the exhibitions held at the CCA is free of charge. A number of artistic and cultural organisations are based at the CCA too, and there are regular collaborative efforts and residencies available to artists. All of these activities ensure a continuing artistic dialogue and the generation of new projects to be put before a wide public. For full details of the eclectic programme on offer at the CCA and information about access and opening hours, visit the centre's website � www.cca-glasgow.com. A little further down Sauchiehall Street, the street on which the CCA is located, between the West End and the City Centre of Glasgow, you will find The Sandyford Hotel, offering quality bed and breakfast accommodation. All 55 comfortable bedrooms are furnished to high standards and have all modern conveniences. 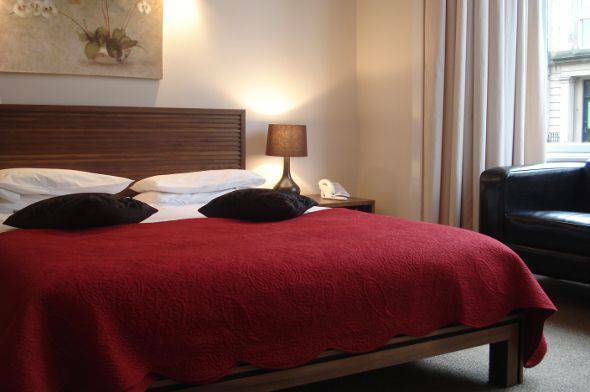 For accommodation near the CCA, you couldn't ask for better than The Sandyford. Our affordable B&B rates include full Scottish breakfast and there is free Wi-Fi access from all of the rooms. To make a booking today at The Sandyford Hotel, simply call our friendly reception staff on (+44) 141�334 0000 to enquire about the availability of rooms during your visit to the Glasgow. Our convenient location makes us the ideal choice for accommodation near the Centre for Contemporary Arts. Bookings can also be made via the online reservation form on this website.